Hamilton’s 1,350-acre campus is situated on a hilltop overlooking the picturesque Village of Clinton. The college is eight miles southwest of Utica, 45 minutes east of Syracuse, one hour from the Adirondack Park to the northeast and 90 minutes west of Albany. If your destination is the Siuda House for Admission and Financial Aid, for accurate results with GPS devices and mapping services such as MapQuest or Google Maps please enter 198 College Hill Road, Clinton, NY 13323, and once you reach campus follow signs to the Admission Office. From the New York City area, New England or points west of Utica, you can reach the College via the New York State Thruway (Interstate 90). Take Exit 32 (Westmoreland), turn right after the toll booth, and then turn left onto State Route 233 South. Drive 5.2 miles, through two traffic lights, until you reach a flashing red light at the intersection of 233 and College Hill Road. Turn right and proceed up the hill for 0.5 miles and make a right onto Campus Road. The Siuda Admission House will be about 0.2 miles on your left. Parking is located directly behind the building. Follow Interstate 81 through Binghamton, N.Y., to Exit 6 (Route 12). Follow Route 12 North through Norwich, Sherburne and Waterville. After leaving the village of Waterville on Route 12, travel approximately 9 miles to Kellogg Street (first left turn after Paris Hill Farms). Turn left onto Kellogg and follow it 2.8 miles to the stop sign in the Village of Clinton. (Village Green will be ahead of you on the right.) Proceed straight onto College Street and continue through two traffic lights until you reach a flashing light at the entrance to the campus. Proceed up the hill for 0.5 miles and make a right onto Campus Road. The Siuda Admission House will be about 0.2 miles on your left. Parking is located directly behind the building. Syracuse Airport, located 45 minutes west of Hamilton College, is serviced by Air Canada, Allegiant, American, Delta, JetBlue and United. Albany Airport, located 90 minutes east of Hamilton College, is serviced by Air Canada, American, Cape Air, Delta, Southwest and United. Union Station is located in Utica, a 20-minute drive from campus. For assistance with arrangements for car rentals or private car services, contact our campus travel agency at 800-472-7447. If you can't get to our beautiful campus (or even if you can and can't get enough! ), here is the next best thing. Clinton is a great college town — lots of history, shops, and food options. 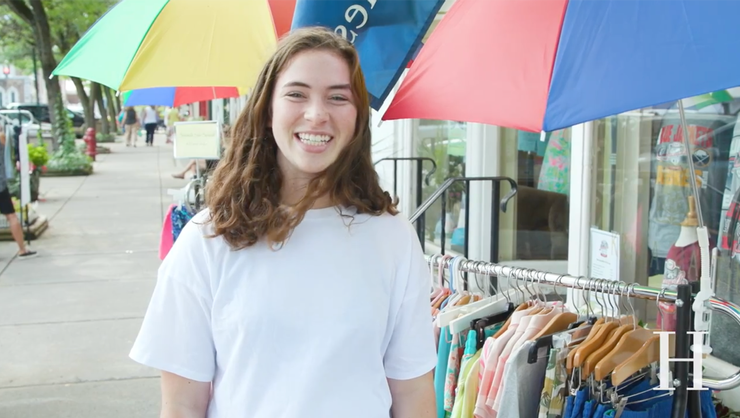 Hamilton students say that being in the village feels like home, they get to know the local shop owners and often see professors shopping or walking their dogs.